Hi, I have a 28K gal. in ground, 1.5" lines (2 skimmer, 1 main & 2 return) with approx. 50ft TDH. I want to upgrade my 20" sand filter to a Hayward 24" sand filter (62GPM). I currently have an old 3/4hp Hayward single speed pump and looking to upgrade to a larger variable pump to support the larger filer...is this a good choice? A Answered on 4/16/2019 by InyoPools Product Specialist Lennox H.
Hi, Greg. Yes, this pump will be sufficient for your pool at full speed. However, with 50 TDH, you're unable to operate the pump below 3000 RPMs. I have a 30k gallon 20x40 pool. Just added a Hayward heat pump and salt water chlorinator last year. Was running a 1.5HP Hayward single speed super pump through 1.5 in plumbing. This year installing all new 2 in plumbing and want to add a variable speed pump. What would be the best model? H, Michael F. This Hayward Super Pump VSP - SP2603VSP or the Pureline Prime 1.65 VSP - PL2605 are good replacement options. 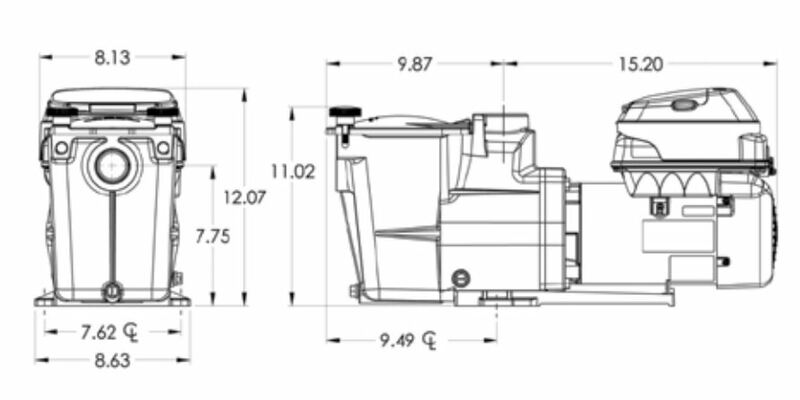 The manufacturer does not provide a pump curve for this pump due to the fact that it has various RPM options. The closest curves that may be relevant to it would be the various curves on all of the Super pump models. Hi, Lonnie. The TriStar 900 or SP3210X15 will be my recommendation based on the info provided. Hi, RF. 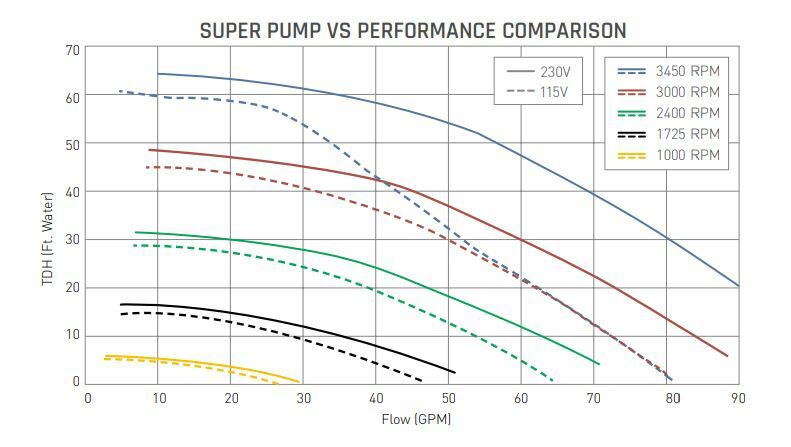 Based on all the info you've provided the Hayward Super Pump VS Pump - SP2603VSP can be used to operate your pool. You will also need to confirm if it will be operating any other water features. I have a Hayward superpump with a SP1610Z1M motor. Would this be a replacement? Hi, Damion. Yes, this Hayward Super Pump VS Variable Speed Pump 230V - SP2602VSP can be used as a replacement. Hi, Jr. I would recommend the Hayward Tristar VS Variable Speed Pump - SP3200VSP. What horse power is needed for a 27,000 gal pool? Thanks. Hi. In order find out what horsepower is needed for your pool, you will first need to calculate the Feet of Head of your pool and turnover rate which can all be found in our How To: Size an In-Ground Pool Pump guide. I have a 25000 gal pool with a 3/4 hp single speed pump w/1.5 in. piping and am looking at replacing with the intellifo 011018. If I went with the Super pup VS Variable Speed Pump what model would I need? Kenneth, You can take a look at the SP2602VSP. Please note that the pump uses 230/240v only. Also, if you have a lot of elbows in your plumbing, the pump will not be able to circulate the water at the lower speeds. We're planning a 10K gallon in-groud pool upgrade -- up from a 3K gallon in-ground swim spa and re-using our salt-chlorine generator (+ roof solar). We need to upgrade the pump/filter and hook it all to the time-clock. Questions: Which filter: C9002 or C12002? Would this pump pair well with either (+ 2in lines)? When connecting to the timer, would the SCG hook to the timer on the pump or would I need a separate time clock (and then bypass the pump timer)? Hi Hunter, The C12002 filter will be better than the C9002. The Super Pump VS pump has 1-1/2" port but a reducer will be needed for 2" pipe. The pump has a built-in timer but the SCG will have to be powered by an external timer. My 24,000 gal. pool has 1 1/2" piping. A local pool supply store recommended the intelliflo vs, which I see you said was overkill, and you recommend this pump instead. They also recommended a Clean and Clear 320 sq. ft. filter, which appears to be oversized for this pump, which filter would you suggest to match with this pump? Thanks! Hi Liam, we always suggest going oversized on the filter as it puts less stress on your pump and you will have less time between cleanings. For these reasons we would suggest staying with the Clean and Clear Plus 320 filter. A Answered on 10/13/2015 by InyoPools Product Specialist Joe S.
What is the difference between the Hayward SP2602VSP and the SP2600VSP? The SP2602VSP has a built-in time clock and the SP2600VSP does not.